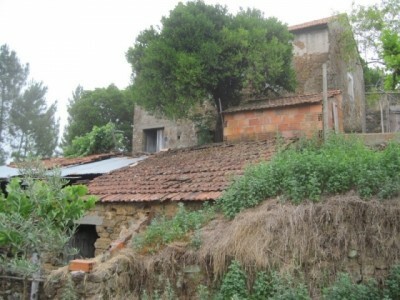 A detached four bedroom stone house in need of renovation works for sale near Cernache do Bonjardim in Central Portugal. The house, which is set over two levels, has electricity and mains water connected and benefits from a deep well. The house measures 58 square meters and is set on a plot of land measuring 1.470 square meters, which is terraced into a valley with a stream at the bottom. There are beautiful views from the house and the garden into the valley and the surrounding hills, covered in lush green. There is a place to park the car off-road just above the house. There is a large water tank, into which the water from the well is pumped, on the terrace next to house. The main entrance opens into the living room, which has a window giving great views into the landscape. From this living room, there are two doors to each side, leading into a bedroom . Each bedroom has a window. The floors and the ceilings of the rooms are wood and need some attention in places. The windows are iron framed. Next to the house, there is an annex housing the dining room and the rustic kitchen. There is a traditional fireplace in one corner and some basic traditional kitchen cupboards. The windows are iron framed and thefloors are concrete. Next to the kitchen, there is another annex, with a recently renewed roof with wood beams, housing the traditional bread oven. To one side of the house, there is a small concrete and stone terrace. There is a terrace in front of the house, and there are two doors on the ground level of the house. One room is used as a wine cellar, whereas the other one serves storage purposes. Both have dirt floors and good standing height. These rooms could easily be converted into more living accommodation. To the front of the house, on a terrace below, there is an annex which has been used as a pig and chicken stall, and yet on another level a bit below, there is a third annex which houses a traditional bread oven and could easily be converted into a self-contained apartment or workshop. All the buildings belonging to this property were built around 100 years ago and have 60 cm thick sturdy built stone walls. The land belonging to the house slopes down into the valley and has a large number of old olive trees and other mature fruit trees, and many grape vines on it. Just one terrace below the property’s boundaries there is a stream from which water is also extracted for irrigation purposes. Alongside the border of the property there is a path serving as access for a tractor to all the terraces. The property is situated in a country location and is only around two kilometers drive from Castelo do Bode lake. The surrounding landscape is hilly and very green, and there are only few houses nearby. All year round, the murmuring sounds of flowing creeks and streams can be heard. The closest town to the property is situated at Cernache to Bonjardim, which is around 10 minutes drive. Cernache do Bonjardim has cafes, bars, shops, mini-market, pharmacy and schools. The larger town of Sertã is around 30 minutes from the property. Sertã has several supermarkets, shops, restaurants, banks, schools, health centres, cafe bars, parks and municipal buildings and is easy to access off the IC8 dual carriageway.